The school is in the process of securing a long-term permanent location at the Cambridgelaan on the Utrecht Science Park. 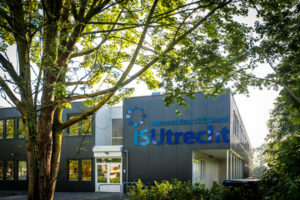 As the school falls under state provision in the Netherlands, it is the municipality of Utrecht that is responsible for the provision of the school’s accommodation. At present, it looks like we will be able to start building the permanent location in 2020. The new campus should be ready towards the end of 2022. This process takes a long time and is ongoing. We will update you as soon as we have more news. From Utrecht Central Station the school can be easily reached either by bus, tram, or bike. (To plan your trip using public transport, please view the ov planner.) |The school can also be reached by car and you will be able to find free on street parking in the vicinity of the school.